We assist Party Wall Surveyors by giving advice on structural matters affecting party walls. We often find that insufficient thought is given to the effect of a development on a party wall and the adjoining property and some proposals we have checked could have led to collapses. 'Special foundations' has a specific meaning under the Party Wall Act and failure to understand its implications can lead to a compromise of the adjoining owners rights. We offer a bespoke service to party wall surveyors, providing them with structural engineering advice in respect of work proposed by building owners following service of Notices under the Party Wall etc Act 1996. We have many years experience of such work, having advised surveyors appointed under the previous legislation in London and, since 1997, under the Party Wall etc Act. One of our consultants, Lawrance Hurst, served as Chairman of the Pyramus & Thisbe Club for party wall surveyors. We advise surveyors appointed by both building owners and adjoining owners. In the mid 1990's, Lawrance addressed the Club on the duties of engineers advising Surveyors appointed by adjoining owners under the 1939 London Act, and at the Club's request this was condensed to a one page note which was circulated to the membership. It was printed in the Club's newsletter in 1997 when the new Act came into force. It still represents best practice advice and can be downloaded through the link below. 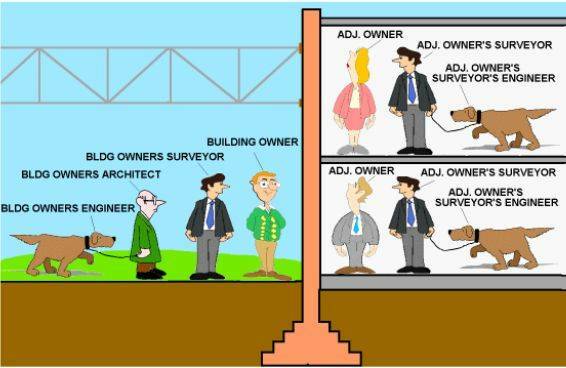 Click to read note on duties of a structural engineer advising a Surveyor appointed by an adjoining owner.